Columbus Travel provides only the best collection of Ecuador and Peru tours featuring sites such as Machu Picchu, haciendas high in the Andes, Quito, Cusco, and Cuenca among many other spectacular attractions. Serving tourists from around the world beginning in 1997, Columbus Travel has been rated as one of the top 3 major on-line agencies based on Galapagos and Ecuador travel by Top Adventure Tours. 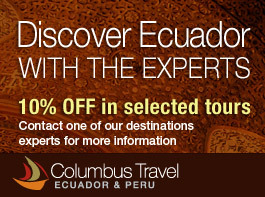 Columbus Travel has also been recommended by The South American Explorers Club and Exito Travel in the United States. Columbus Travel customers are given only the best and most reliable services available. 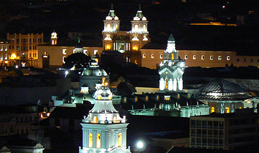 Many of the popular tours Columbus Travel provides in Ecuador are expeditions and outings to the cities of Quito and Guayaquil, Andean villages in the Sierra, tours with a combination of different regions from the Andes to the Pacific Coast, and charming hotels. In Peru, Columbus Travel is your destination expert to the region of the Andes that are famous for its Pre-Columbian culture and ancient ruins of Machu Picchu, which was recently dubbed one of the New 7 Wonders of the World. Guides who work for Columbus Travel are some of the highest qualified guides in the tourism industry. They are all bilingual, speaking English and Spanish, among many others such as Italian or even the Ecuadorian native language Quechwa. All of our guides have many years of experience and a natural love for Ecuador and Peru’s beautiful landscapes and rich history. Almost all of Columbus Travel’s guides have traveled all over South America and even Europe. He is a certified National Tourist Guide, Trekking Guide, and Naturalist Guide for the Amazon, Cotopaxi, Chimborazo Reserve. 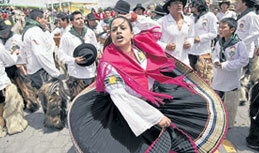 Born in Cuenca, Ecuador, Wilson graduated from the University of Azuay in which he obtained a degree in Tourism. 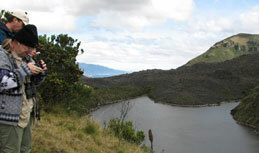 Continuing his education, Wilson received a Naturalist Guide license from “El Cajas” National Park. Wilson has more than 10 years of experience as a national tour guide and has had the opportunity to work with a large diversity of tourists throughout the years, including groups of families, archaeologists, reporters, photographers and important business figures in numerous categories of tours such as cultural, adventure and community tourism. Wilson speaks Spanish, Italian, French and English. He is very passionate about Ecuador and having the opportunity to share his enthusiasm and knowledge of each tour he gives is what he loves most about his career as a guide. Gonzalo’s love and passion for nature drove him to pursue a National Guide License from Ecuador as well as a Naturalist Guide Certification for many protected areas such as Cotopaxi, Iliniza, Cotocachi, Chimborazo, Antisana and Cayambe. He also speaks English, Spanish, basic Italian and Kichwa. Ganzalo has trekked over many of the Andes Mountains and traveled throughout more than half of South America, as well as many European countries. Having worked in the travel business for many years as a tour operator, Gonzalo loves to work directly with those traveling in Ecuador. Alfredo Carrera has many years of experience under his belt with a wealth of knowledge to go along with it. He is a certified National Tourist Guide, Trekking Guide, and Naturalist Guide for the Amazon, Cotopaxi, Chimborazo Reserve, Ilinizas, Sangay and Llanganates Mountains. Additionally, Alfred has also completed search and rescue courses for aggressive terrain and landscapes and is even a licensed teacher of Guiding Techniques and Ecuador’s Geography. His guiding experience includes about seven years of trekking, over 10 years of national guiding, and four years guide work at four different lodges in the Amazon, including some museum work.